Vanquish. One of the world’s great Super GTs and the quintessential Aston Martin. To celebrate this much-loved and highly-acclaimed flagship as it enters the final phase of its production life, Aston Martin has created a very special model to bid a farewell: The Vanquish S Ultimate. Like the regular Vanquish S, the Ultimate edition is powered by Aston Martin’s legendary naturally-aspirated 6.0-litre V12. With 595bhp and a spectacular soundtrack, scintillating performance is guaranteed. An 8-speed Touchtronic III automatic transmission gives an impressive combination of response and refinement, while 3-stage adaptive damping and carbon ceramic brakes complete a package born to deliver one of the great modern driving experiences. Limited to just 175 cars worldwide, the Ultimate edition is available in Coupe or Volante form and is available in a choice of three exterior colour schemes which have been thoughtfully crafted by the Aston Martin design team. In addition to the specially created colour and trim packages there are a suite of details that are also unique to the Vanquish S Ultimate. These include carbon fibre side strakes featuring rose gold ‘Ultimate‘ decals, carbon fibre treadplates and an ‘Ultimate’ sill plaque, a special stitched quilting design on the seats, plus ‘Ultimate’ headrest embroidery. 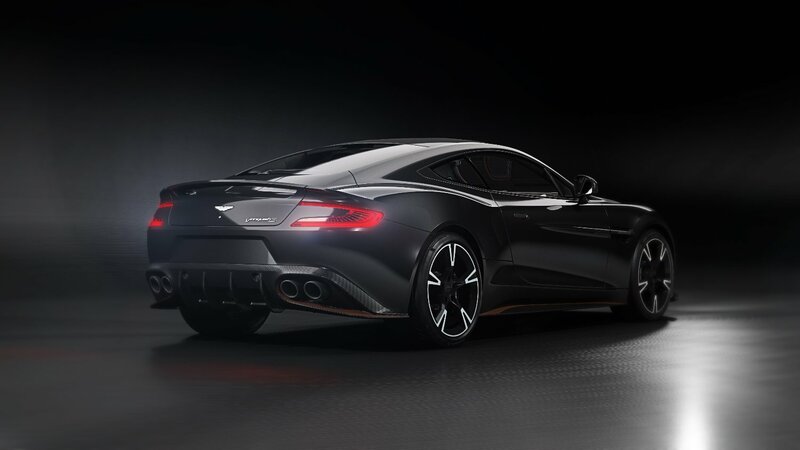 The first of these Designer Themes is a monochrome design that mates Ultimate Black paintwork – – a nod to the first generation Vanquish S Ultimate Edition, for which this colour was first created – with Copper Bronze graphics around the front air intake, along the side sills and on the rear diffuser. Detailing includes black exhaust tailpipes, brake calipers, window trims and 5-spoke wheels, plus extensive use of carbon fibre for the bonnet louvres, front grille and side strakes. The interior features Obsidian Black leather with Chestnut Tan accents and stitching and carbon fibre twill facia. The second Designer Theme takes inspiration from the look and materials used in technical sportswear. The striking combination of Xenon Grey paint and contrasting Cobalt Blue graphics combine perfectly with the Ultimate’s carbon fibre and black trim. Yellow brake calipers provide further contrast behind gloss black 5-spoke alloys. The same family of exterior hues continue to the interior, where Electron Yellow accents and Spectral Blue stitching stand out against the Phantom Grey leather upholstery. The third of the Designer Themes consists of cool White Gold paintwork and warm Bronze graphics working brilliantly with gloss black and carbon fibre exterior detailing. Chestnut Tan leather with Obsidian Black accents puts a contemporary twist on a traditional colour combination, while the spectacular cuprum carbon fibre facia is a visual delight. In addition to the Designer Themes, customers can elect to combine any exterior scheme and interior package as a no-cost option. 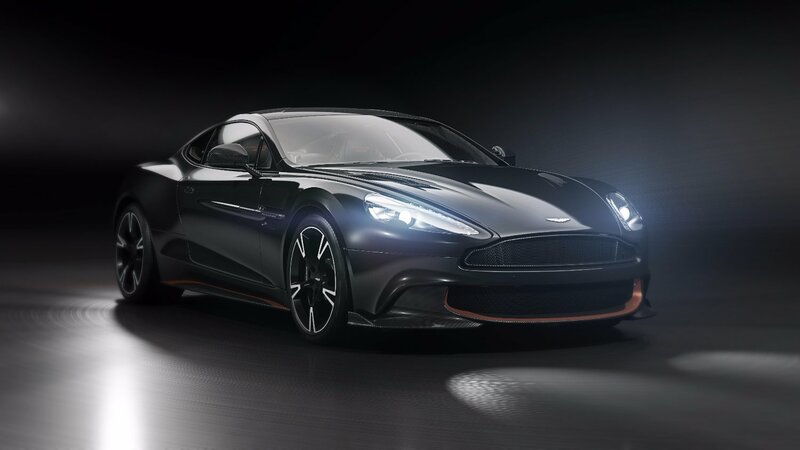 Marek Reichman, Aston Martin Chief Creative Officer, said: “With the Ultimate Edition we have accentuated the Vanquish S’s unique blend of tradition, technology and craftsmanship with a selection of three bold exterior paint schemes and hugely appealing interior packages that make creative use of exciting materials. Our design team has created three unique themes which unite an exterior and interior package, but we have been careful to ensure each exterior colour and interior theme work well together to offer our customers maximum choice”. Aston Martin VP & Chief Sales Officer, Christian Marti said of the Vanquish S Ultimate Edition: “Since the Vanquish was first introduced it immediately established itself as the pinnacle of our series production range. It has since evolved into a truly formidable machine. As the much-loved and highly-acclaimed Vanquish S nears the end of production, we wanted to celebrate its success with a limited run of very special cars. The Ultimate edition perfectly captures the spirit of Vanquish and is sure to be sought after by collectors around the world”.